Time to check in and share what I’m loving right now – four mini reviews are definitely more exciting than one review, right? I’m right in the throes of a pink obsession, and I love a good theme. 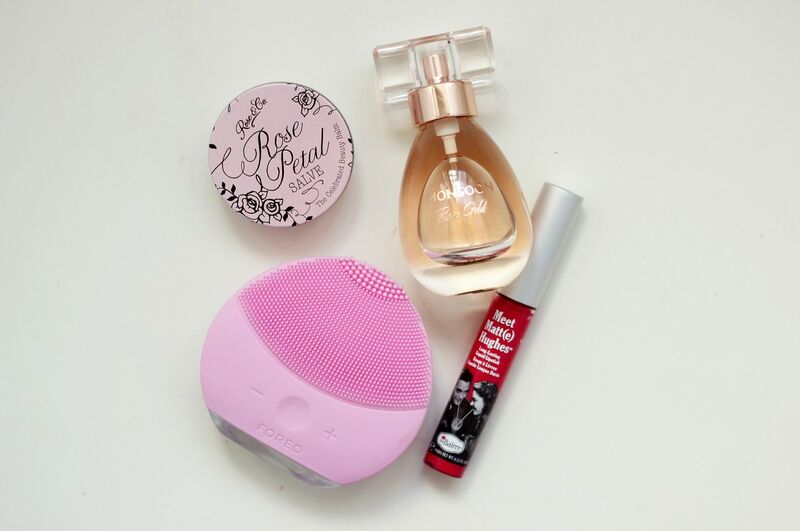 Foreo Luna Mini two – I loves a good skincare gadget, and I have been loving incorporating this cute little gadget into my evening skincare routine. Living in London, I am always conscious of making sure my skin is completely clean at the end of the day because the tube, pollution and general grime can wreak havoc with your skin. I think the Luna is a bit of a skincare game-changer because it makes skin feel so clean without feeling harsh or abrasive. theBalm Meet Matt(e) Hughes in Sentimental – I am obsessed with all things pink at the moment, and this lipstick is my current go-to. I did a full post about it here on Friday, but it’s just a nice brightening shade of pink. Monsoon Rose Gold Eau de Parfum – I wouldn’t think to look in Monsoon for a fragrance, but this is lovely – it smells warm, velvety and a bit powdery and is perfect for summer. I’ve been slinging this in my bag because it’s the perfect size for a little refreshing spritz come midday. Rose petal salve – Continuing on with the pink theme, this is the latest lip balm to join the ranks. It’s like a (much) cheaper By Terry baume de rose, and just does a good job at keeping lifts soft and smelling of roses.